I don't engage in mommy wars. Life is too short to argue with other moms about the choices they make. I advocate for things I am passionate about (example: breastfeeding), but ultimately, if you choose to formula feed your baby, I'm not going to give you a hard time about it. Sometimes, though, people don't have to tell you their judgements in words. You know what I'm talking about? 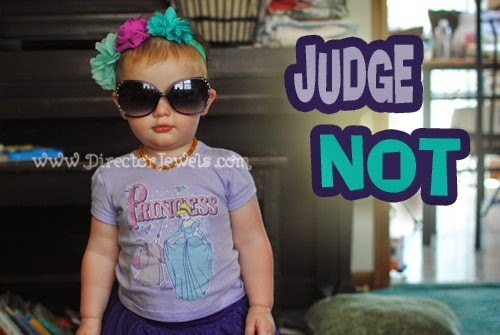 That old lady who gives you the stink eye at Target because your kid is trying to climb on the conveyer belt. Or the mom who watches you, eyes raised, as you wrangle your kid to the car after only fifteen minutes at the park. I'm sure I've been guilty of this silent judgement, too. But I'm declaring to all of you: my readers, my family, and myself: it has to stop. There is no way for you (or me) to know what is going on in these situations you encounter with perfect strangers in your community. My son runs away from me in parking lots. The last time I took my kids to the park, Lincoln refused to listen to any of my requests to stay near me. He preferred to run across the park and climb on rock structures - far out of my reach should he fall. I got death stares from other parents because I followed him around and insisted that he stay within a 10-foot radius of myself and Addie. We finally just left the park because I was too stressed out about him running off and ending up in the street. I'm not sorry I made this decision, because the last time I gave him the opportunity to explore on his own outside my circle of trust, I almost lost him. I haven't told many people (in real life) that my daughter had oral surgery to fix her badly decaying teeth. I fully admit that I was the judging mom about early childhood tooth decay the first few times I heard about it. I thought...really...who doesn't brush their kid's teeth and feeds them enough junk food and juice that their baby teeth start to crumble? But then it happened to me: the mom whose kids never drink juice, never eat ice cream, and consider an animal cracker a respectable cookie. And now I realize, it was so unfair of me to blame another mom for this sort of thing. Because chances are, she - just like me - spent weeks crying and feeling like a failure because she didn't know what she did wrong. I don't know what my next controversial mom thing will be. But in the meantime, I'll be doing my best to smile at every single mom I encounter - regardless of how her kids look or behave. She is probably beating herself up about something and friendly support is something I can do. Have you ever felt judged for the choices you've made as a parent? Preach! Fully agree that it has to stop. I'm the hovering mom at the playground too, or really anywhere. We don't drink juice or eat cookies either. You're doing the best you can, and it IS enough :) Everyone else can go sit on a tack!